It was a sad day for fans of Sizeze Eswatini on Saturday when the national side went down 5-3 against Lesotho. The game played in Maseru was the first of two international Friendlies planned for the two sides. The return match will be played in Swaziland at the Mavuso Sports Stadium on Saturday May 24th. Imbali at Allianz Park during the Touraid U/13's Girls Tag TournamentImbali the U/13's girls side who are in the United Kingdom representing Swaziland in the Touraid tournament have managed to take third place in the competiton. The Little Rhino's wearing their kit donated by LV-SOSKitaidThe team from Sidvokhodvo Nazarene Primary, the Little Rhino's were at the rugby union offices today to collect jerseys, shorts and socks donated by the UK based charity, LV-SOSKitaid. Imbali Girls with Sipho Magagula the Director of Sport (r)The Director of Sport in the Ministry of Sport Mr Sipho Magagula was at the rugby union's offices today to bid farewell to Imbali, the u/13's girls side who will be participating in the Touraid Tag Rugby Tournament. Ollie Hill Tom WhiteThe Rugby Union welcomed two more volunteers this week. Players were called back to national training this week. after a two week break the players were back at training at the UNISWA sports griund in preparation for the up and coming friendly against Lesotho. Thirty eight players have been invited to attend the squad training sessions. The coaches were in Ngwazini this week to hold a Community Coaching session. Freddie Chalmers and Hector Jervis with Sipho Magagula the Director of Sport at the Ministry of SportThe two volunteers Hector Jervis and Freddie Chalmers were at the Ministry of Sport this week to meet with Sipho Magagula the Director of Sport at the ministry. 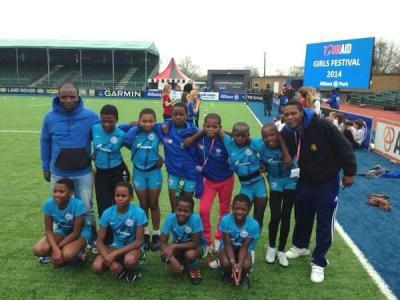 After winning the inter schools tag rugby tournament, it was decided by the development coaches that the girls from Entuthukweni Primary school would fly to the UK and participate in the Touraid Girls U/13's Tag Rugby Tournament to be played at the Allianz Park in April.